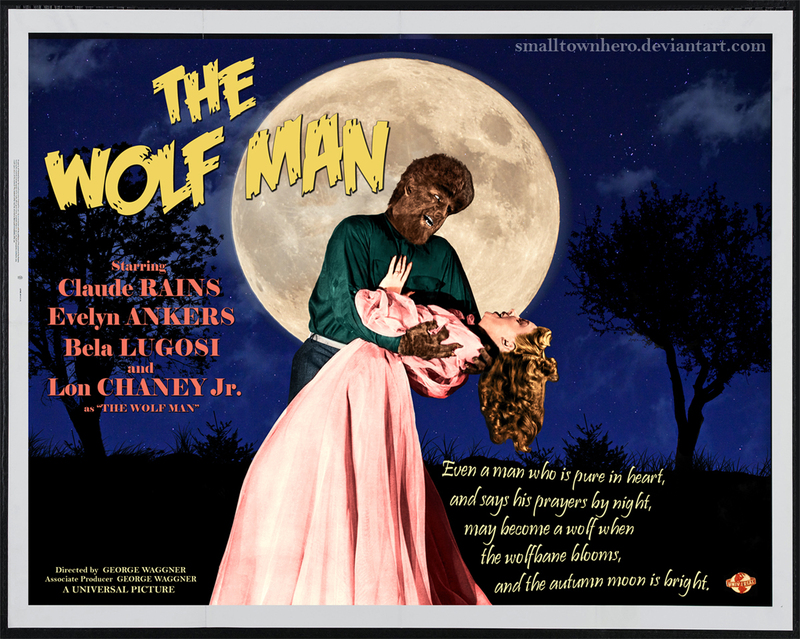 This 1941 film is widely considered to be one of the classics of the horror genre, because it introduced the world to one of the most famous movie monsters of all time: Lawrence Talbot (Lon Chaney, Jr.), an innocent man bitten by a wolf, who then succumbs to the curse of lycanthropy. After Count Dracula and Baron Frankenstein, THE WOLF MAN probably ranks third in the pantheon of Universal Pictures’ famous movie monsters. Unfortunately, the film itself is a classic without being an actual masterpiece. It is glossy and atmospheric, but it lacks the imaginative impact and artistic sensibilities of DRACULA and FRANKENSTEIN (both made ten years earlier), relying on solid studio production values (sets and photography), plus its fine cast, to compensate for director George Waggner’s competent but not necessarily inspired handling of the material. The story follows Talbot (Chaney) as he returns to his ancestral home after a stay in America. He escorts two ladies to a gypsy camp where they have the fortunes read, but the fortune teller, Bela (played by DRACULA’s Bela Lugosi) is disturbed when he sees a pentagram in the hand of one of the girls – a sign that she will be the werewolf’s next victim. On the way home, the trio are attacked by a wolf, which Talbot kills with his silver-headed cane; however, Talbot (who was bitten in the struggle) is found next to the body of Bela. An old gypsy woman (Maria Ouspenskaya) informs Talbot that Bela was a werewolf and his bite has passed the curse on to Talbot. Now he will transform into a wolf and kill against his will; the only way to end his cursed existence is with silver. The gypsy woman’s prediction comes true, when Talbot changes and kills a gravedigger. He tries to convince his friends and father, Sir John Talbot (Claude Rains), but of course no one believes him. Finally, late at night, he attacks Gwen (Evenlyn Ankers), but Sir John manages to kill him with his silver-headed cane, ending the curse. Though fans of old movies sometimes think of horror films from the 1930s and 1940s as being equally classic, the later decade was actually an era marked mostly by rehashing old material. THE WOLF MAN is no exception, being basically a re-thinking of 1935's somewhat overlooked THE WERE-WOLF OF LONDON. THE WOLF MAN, however, seems relatively fresh, because it is not a sequel but a new take on the subject matter. 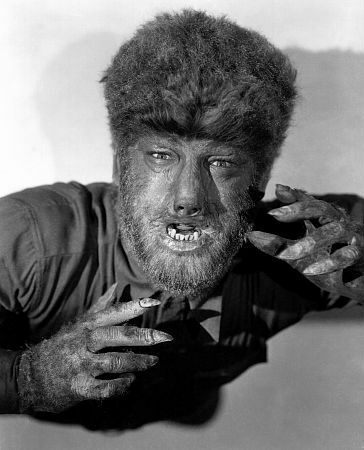 The studio's earlier attempt at lycanthropy introduced the notion that a werewolf is not a man who transforms into a wolf but a monstrous hybrid who undergoes an involuntary transformation during the full moon and passes his affliction to others, with a bite. THE WOLF MAN incorporated and expanded upon this mythology, dropping the full moon and adding the idea that a werewolf is immortal and invulnerable – except to silver. Additionally, the werewolf became a less human, more beastly creature. Chaney is not a sinister presence in the manner of horror stars Lugosi or Boris Karloff, but he is perfect casting for as Talbot – an initially easy-going fellow who gradually transforms into a guilt-ridden, tortured man as he becomes convinced that he is a monster. Also impressive is the makeup by Jack Pierce and the transformation special effects by John P. Fulton (a series of lap dissolves that show fur gradually appearing or disappearing). Apparently, a similar make up by Pierce had been intended for WERE-WOLF OF LONDON, but actor Henry Hull had refused to have his face completely covered with fur. Lon Chaney Jr was a better sport about the whole thing, with the result that he achieved cinematic immortality in the role that caught on in the public imagination, turning him into a horror star (the “New Lon Chaney,” as Universal called him, after his famous father, who had starred in Universal’s 1925 version of PHANTOM OF THE OPERA). Nevertheless, THE WOLF MAN is riddled with flaws, the most obvious being that the filmmakers are inconsistent about whether or not a lycanthrope turns completely into a wolf or into a man-wolf hybrid. We are left to ponder why Bela Lugosi (the old generation passing on the curse of typecasting to the next generation?) is replaced by a real wolf when the full moon rises, instead of putting the actor in a werewolf makeup like Chaney's. Also, Siodmak’s poetic speeches (“Even a man who is pure in heart and says his prayers by night/May become a Wolf when the Wolfbane blooms, and the Autumn Moon is bright”) wear out through repetition. The film is also somewhat blunt and unsophisticated in its technique, showing its monster perhaps a bit too clearly, instead of using shadows and suggestion to work on the viewer’s imagination. This is a complete reversal of what was intended in Siodmak's original script, which left the question open of whether Talbot really transformed into a wolf or only thought he did. Much of the material relating to this psychological interpretation remains in the script: there are constant references to psychology and the mind; even the term "lycanthropy" is defined not as turning into a werewolf but as a delusion of turning into a wolf. Consequently, the finished film seems ever so slightly schizophrenic, laying the groundwork for an ambiguous approach that is abandoned in favor of a full-blown monster movie. The decision to show the Wolf Man clearly appears to have beena last minute one. There is little footage of the monster (which inevitably disappoints younger viewers), some of which is repeated. The monster scenes betray some continuity lapses (Talbot takes off his shirt during his first transformation, but he has it back on when he is seen in Wolf Man form, running through the woods), further indicating that the footage was hastily inserted without being properly thought through. In spite of all this, THE WOLF MAN manages to survive because it lays out a mythology that seems like authentic, archetypal legend, when in fact it is mostly cinematic invention. Unlike his brethren, Dracula and Frankenstein, the werewolf has no literary classic to serve as the basis of film adaptations; although the lycanthrope, like the vampire, has a history in mythology and superstition, little of it remains in the screen incarnation. European tales of werewolves cast the creatures as voluntary shape-shifters, generally evil sorcerers and thus likely candidates to return from the grave as vampires. Universal Pictures' Wolf Man is an altogether different creature, a good but hapless mortal inflicted with a curse. In WERE-WOLF OF LONDON, Hull had played a scientist who was bitten in the line of work, placing him firmly in the tradition of mad scientists established by Robert Louis Stevenson in “The Strange Case of Dr Jekyll and Mr Hyde.” By casting Chaney’s Talbot as an ordinary guy instead of a scientist (he’s no good with theory but enjoys working with his hands), THE WOLF MAN breaks any tenuous connection between the werewolf and Stevenson’s tale: Mr. Hyde, though cunning and evil, was a man, not a beast; even Hull’s hapless Wilfred Glendon was a combination of both. Chaney, on the other hand, plays a character cursed entirely “through no fault of his own,” and his bestial transformation leaves no remnants of his humanity intact. THE WOLF MAN was such a hit with audiences that he reappeared in several subsequent films. Unfortunately, Universal was running out of ideas by this time, so Lawrence Talbot was doomed to co-star in a series of team-up movies that cast him alongside Universal’s other frightful fiends: FRANKENSTEIN MEETS THE WOLF MAN (1943), HOUSE OF FRANKENSTEIN (1944), and HOUSE OF DRACULA (1945). His last appearance was playing straight man in the 1948 comedy ABBOT AND COSTELLO MEET FRANKENSTEIN (which, like the two “House of” movies, teamed him with both Count Dracula and Frankenstein’s monster). None of these is a classic horror film, but FRANKENSTEIN MEETS THE WOLF MAN is good, brainless fun, especially for kids, and the Abbott and Costello movie is actually better than most of the “serious” horror films of the decade. The Wolf Man (1941). Directed by George Waggner. Written by Curt Siodmak. Cast: Lon Chaney Jr, Claude Rains, Ralph Bellamy, Patrick Knowles, Bela Lugosi, Maria Ouspenskaya, Evelyn Ankers. NOTE: Some of the material in this review originally appeared in Imagi-Movies magazine 1:4, copyright 1994. This article is copyright 2008 by Steve Biodrowski.